Billy was energetic, engaging with the customers on another busy arvo. The clouds had whipped up for a while by now and soon the inevitable expected rain, with turbulent winds and pelting water, washed the windows and outside pavements, as if a baptism by Nature - and I thoroughly enjoyed the ambiance, cocooned in a rather remarkable refuge - the Cornersmith, at the junction between Illawarra and Petersham Roads in a rather densely populated inner suburb of Marrickville. I somehow sensed that most of the visitors to Cornersmith are regulars, part of the cafe's culture of being different, of being focused on what they are and how they are serious about it. The place is not overly large, reminiscent of being in Melbourne, its dark shady interior accentuated by the weather. people moved about with an intent, a purposeful lifestyle. Rustic bread, Aranchini and Spanish olives......a setting like a family restaurant, ample vehicle parking in its own compound. Formerly named the Vespa Cucina Bulli, the change in restaurant name also means a different, more streamlined menu. Pizza is still their forte and the interior still looks familiar to me. Italiana is emphasised but the new menu seems to have no chicken or lamb in its mains. Service is professional and friendly. Customers lining up all the way to a wide counter from the entrance and up the several steps of slight stairs. The sun shining with a high level of humidity outside. Chatter at small tables and almost all seats filled up. 3pm on a Saturday afternoon. The place is really full but the counter has enough attractions. Our requested strawberry drinks and coffee comes within a reasonable time despite the huff and puff. The staff that day find it perhaps hard to cope. Used tables with clutter are not cleared sufficiently on time. The crew in the kitchen look preoccupied, they are busy, They utilise plastic hand and arm holders but I wish one or two of them do not wear sleeveless when working handling food. Maybe they should have a fan to help cool them down in such an enclosed kitchen. We sit watching them through the wired netting that separates the customer space from this kitchen. It's Allpress coffee blends. It is also the barista. The location, at a village north of Wollongong. Primed for summer traffic. Locals and Sydneysiders visiting Austinmer and Thirroul would not miss this cafe by the main road. The food is clean cut and good for on the go. There is not much seating but is perfect for a stop by, especially when both the sky and ocean are both blue. Attractive almond croissants and banana loaves. Teas and sourdoughs are also featured. The barista is friendly as well as the other staff. Children frolic around or have seats accompanied by Mum or Dad. It is like Surry Hills in the Mornington Peninsular. The mood is casual and relaxed. The ambiance is residential yet holiday. A perfect cycling or motor bike stop. Or pick up a cuppa before resuming your chores. The breads are a gem. 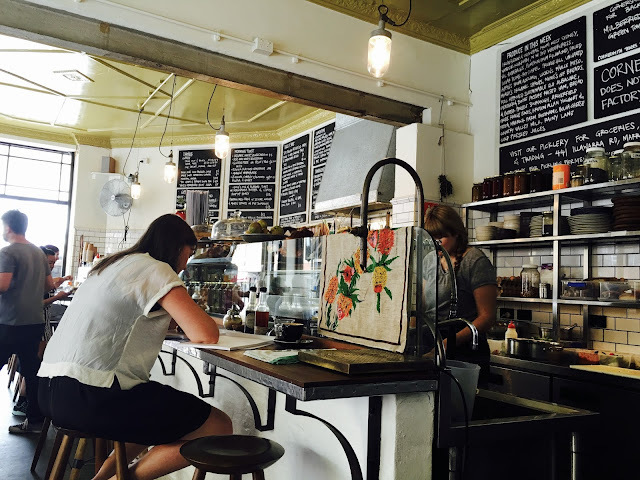 Bread, Espresso & is located along Lawrence Hargrave Road on the northern side of Thirroul. The nearest cross road is Henley Road. It is more of a fusion Vietnamese cuisine, with an upmarket setting, a calming light subdued interior with an upstairs. Portions are good, service is friendly and bookings are essential on weekends. Located almost smack in the middle of Marrickville's main strip, Bau Troung here, with a distinctive blue coloured logo, offers a different dining experience from the stereotyped Vietnamese restaurant, even if its roots are home grown and traditional. The menu reflects its grass roots, although some offerings have been tweaked to a modern and more Australian audience. They take pains with presentation at Bau Troung Marrickville, recognise the Aussie need for meats and tone down the spice and chili. Having said that, I was delighted they served anchovies, but to a palatable degree, in a salad. The other Bau Truong restaurants in Cabramatta and Canley Heights respectively in the greater Sydney region perhaps are of a different set up and even wider menu options. Cold brew coffee on draft. Choices. I come for breakfast but often forget that this is truly a coffee place as well. The cronuts are to die for and so is the coconut chai morning pudding. There are Assam and Green Dragon Well teas available, but more captivating to me are the herbal infusions, like the ginger, mint and lemongrass concoction, with fennel seeds thrown in. I love looking at the black board choices. Garry and Nicole can tailor make a menu to suit the customer's preferences for a party or gathering - and therein lies the fun. Their supplies are also made available at Coffee Guru Corrimal, Ruby's at Bulli Beach and in various outlets in Cronulla like Frangipani Gelato and Fifth Season. Reay's also emphasise on catering and supplies, for corporates, weddings and more in various items like wraps, sandwiches, quiches, baguettes and tarts. And their passion is in creating cakes, like the Tower consisting of Red Velvet Macarons, cupcakes and cheesecakes. They also feature scones, chocolate brownies and French Macarons. Reays is located at the corner of Vereker Road and Cabbage Tree Lane in Fairy Meadow NSW, a suburb ten minutes by car north of Wollongong CBD. Address is 5 Vereker Road. Opening hours: Seven days from morning till late arvo. With vehicle parking provided below, Market City in Sydney's Chinatown can be a hive of activity any day or night of the week. With an upper level food court, ground floor supermarket, clothing outlets and Paddy's Market at street level, it can be a focus for many thronging the southern end of Sydney CBD. Recently I had yum cha with four other friends at The Eight, located on the upper most floor. The staff still converse in Cantonese in this restaurant, apart from English and Mandarin. The food trolleys really get going from around 11am even if the place opens earlier. And remember, do always get your tea pot topped up by the male staff members, and watch for that table card being stamped by your orders to add up. The clutter in any yum cha session can be minimised by asking staff to clear finished plates. The Thai Temple in Annandale, Wat Buddharungsee, is located at 49 Trafalgar Street. The fair depicted above was held on the third Sunday of November in 2015, commencing at 9am and usually finishing up around noon. It was a partly rainy day but that did not dampen the spirit and enthusiasm of the local Thai community and their friends. Generous portions of food, non-vegetarian and vegetarian, from starters to desserts reflecting the variety of Thai cuisine were made available to visitors. Inside the temple itself, there were ceremonies conducted to commemorate Kartina and the offering of vegetarian food to the monks. Thai Government representatives also attended.